Warehouse with office space, plus mezzanine area. The warehouse area measures over 9,000 sq. ft. which includes two enclosed storage areas with wood shelving. Storage areas have reinforced ceilings for overhead storage. Warehouse area has two loading docks with roll-up door panels measuring 8 x 10 ft and one bay with drive-up ramp measuring 8 x 14. Concrete flooring in warehouse with the mid-ceiling height measuring 18 ft. Office space is heated and cooled. Two bathrooms are located in the office area. One small office area in warehouse is located between loading docks. Property is located on a corner lot with asphalt parking area. Property includes one additional adjacent lot measuring 100 x 200 ft. 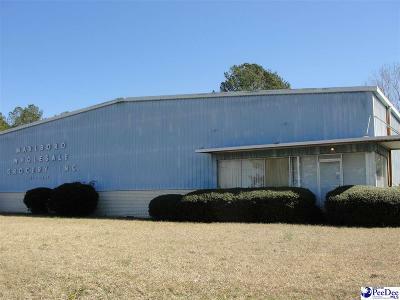 Warehouse is located in close proximity to Hwy. 15-401 and Hwy. 9 via Beauty Spot Rd.